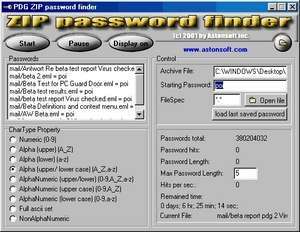 ZIP Password Finder is a very simple freeware password finder utility which aids users in cracking or otherwise figuring out the password of ZIP files. While the program isn't very advanced, it does include a rather large database which it uses to try and guess the password of a ZIP file which would otherwise be inaccessible. This program actually utilizes dictionary-style attacks and performs the guess-work based on a large database it has of common and uncommon words. It uses these dictionary words in several different ways, namely by using numbers, letters, a combination of both and tries several combinations of these password guesses as upper or lower case. For security reasons, you should also check out the ZIP Password Finder download at LO4D.com which includes virus and malware tests. Additional screenshots of this application download may be available, too. 4.57 out of 5 based on 95 ratings. ZIP Password Finder has a presence on social networks. ZIP Password Finder download been highly rated by our users.